The Classical Greek shipwreck at Tektaş Burnu was located during one of INA’s annual Turkish shipwreck surveys and excavated by INA between 1999 and 2001. The ship sank to a depth of 45 m between 440 and 425 B.C. or shortly thereafter, making it the only shipwreck from the pinnacle of the Athenian maritime empire to be excavated in its entirety. The vessel was transporting over 200 transport amphoras filled with wine, pine tar, and butchered beef, in addition to smaller quantities of ceramic lamps, bowls, drinking cups, and table amphoras from East Greece. Analysis of the transport amphoras revealed various pre-firing stamps including a single previously unattested example of a type featuring the Greek letters EPY, the ethnic of the Greek city of Ionian Erythrae. This attribution helped to establish the amphora typology of this important Ionian city, and provided precious evidence for the poorly-attested Classical period in a place that lay at the periphery of the Athenian empire. The Tektaş Burnu shipwreck also produced the only stratified examples of marble ophthalmoi (marble ship’s eyes) from an ancient shipwreck. Van Duivenvoorde, W. 2014. “The 5th-Century BC Shipwreck at Tektaş Burnu, Turkey: evidence for the ship’s hull from nail concretions,” International Journal of Nautical Archaeology 43.1: 10-26. Carlson, D.N. 2013. “A View from the Sea: The Archaeology of Maritime Trade in the Fifth-Century B.C. Aegean,” in Handels- und Finanzgebaren in der Ägäis im 5. Jh. v. Chr. (Trade and Finance in the 5 th c. BC Aegean World) edited by A. Slawisch, BYZAS 18 (Istanbul), 1-23. Carlson, D. 2009. “Seeing the Sea: Ships’ Eyes in Classical Greece.” Hesperia 78:347-365. Carlson, D. 2005. “A Wreck from the Golden Age of Greece: Tektaş Burnu, Turkey.” In Beneath the Seven Seas edited by G. F. Bass, 64-71. New York and London: Thames and Hudson. Jurgens, J.A., R.A. Blanchette, and D.N. Carlson, 2004. 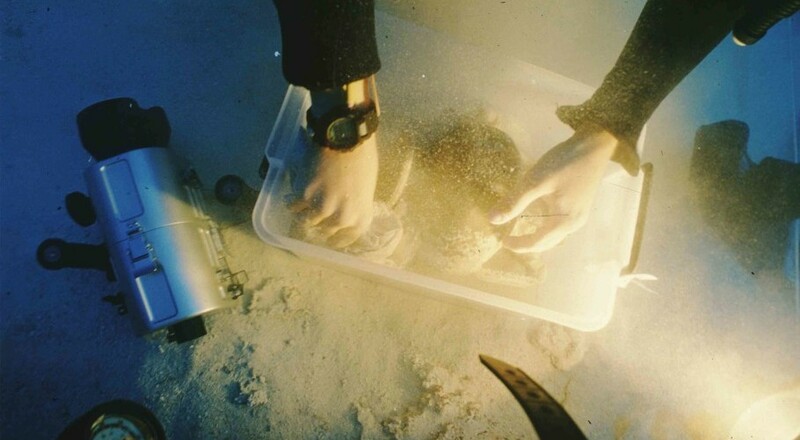 “Evaluating the Wooden Remnants of the Tektaş Burnu Shipwreck.” In Art, Biology, and Conservation: Biodeterioration of Works of Art edited by R.J. Koestler, V.R. Koestler, A.E. Charola, and F.E. Nieto-Fernandez, 390-409. New York: The Metropolitan Museum of Art. Carlson, D.N. 2003. “The Classical Greek Shipwreck at Tektaş Burnu, Turkey.” American Journal of Archaeology 107:581-600. Carlson, D. 2002. “The Excavation of A Fifth-Century B.C. Shipwreck: 1999 Campaign.” InTropis VII: 7 th International Symposium on Ship Construction in Antiquity edited by H. Tzalas, 93-102. Athens: Hellenic Institute for the Preservation of Nautical Tradition. Carlson, D. 2002. “The Final Excavation Season at Tektaş Burnu, Turkey.” INA Quarterly 29.2:12-14. Green, J., S. Matthews, and T. Turanli, 2002. “Underwater Archaeological Surveying Using PhotoModeler, VirtualMapper: Different Applications for Different Problems.” International Journal of Nautical Archaeology 31:283-92. Carlson, D. 2001. “The 2000 Excavation Season at Tektaş Burnu, Turkey.” INA Quarterly 28.2:3-8. Trethewey, K. 2001. “Lead Anchor Stock Cores from Tektaş Burnu, Turkey.”International Journal of Nautical Archaeology 30.1:109-14. Nowak, T.J. 2001. “A Preliminary Report on Ophthalmoi from the Tektaş Burnu Shipwreck.” International Journal of Nautical Archaeology 30.1:86-94. Gibbins, D. 2000. 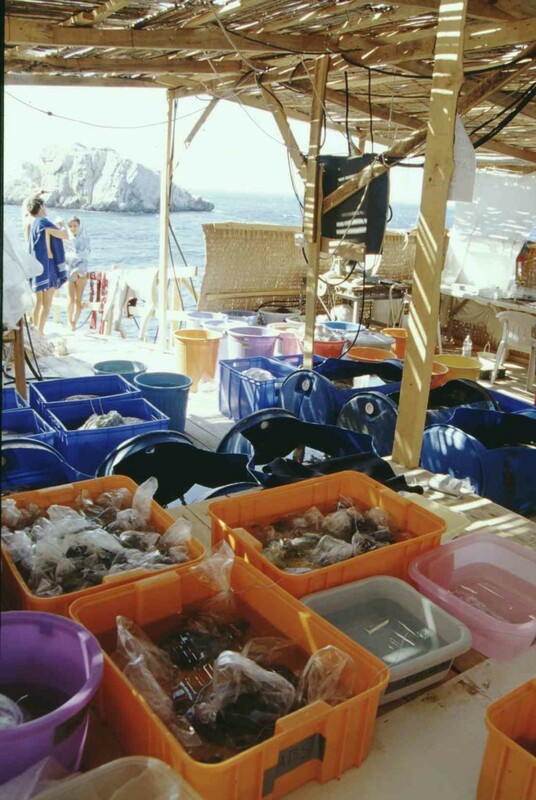 “The Classical Shipwreck Excavation at Tektaş Burnu,” Antiquity 74:19-20. Carlson, D. 1999. “The 1999 Excavation Season at Tektaş Burnu, Turkey.” INA Quarterly 26.4:3-8. Nowak, T.J. 1999. “A Marble Ophthalmos from Tektaş Burnu.” INA Quarterly 26.4:10-11. ABOVE: Ceramics are placed in freshwater baths to remove chlorides (Left Photo: INA). 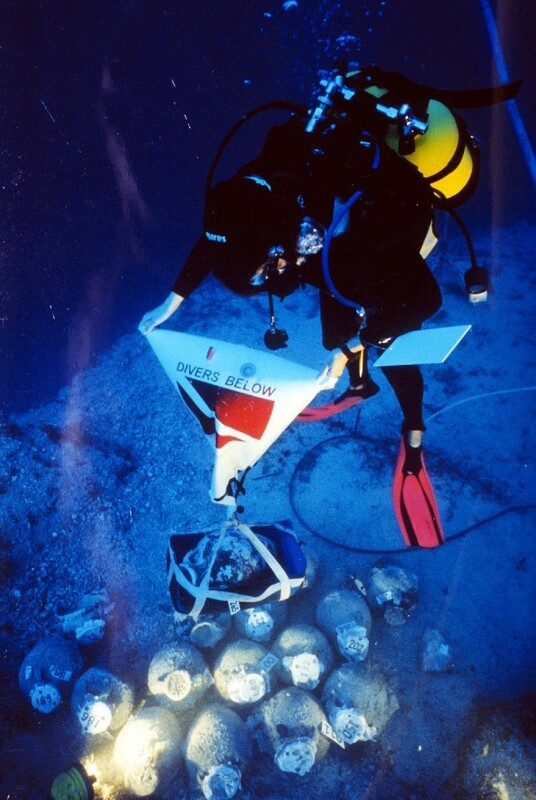 An archaeologist uses a lift bag to raise an artifact to the surface (Right Photo: INA).